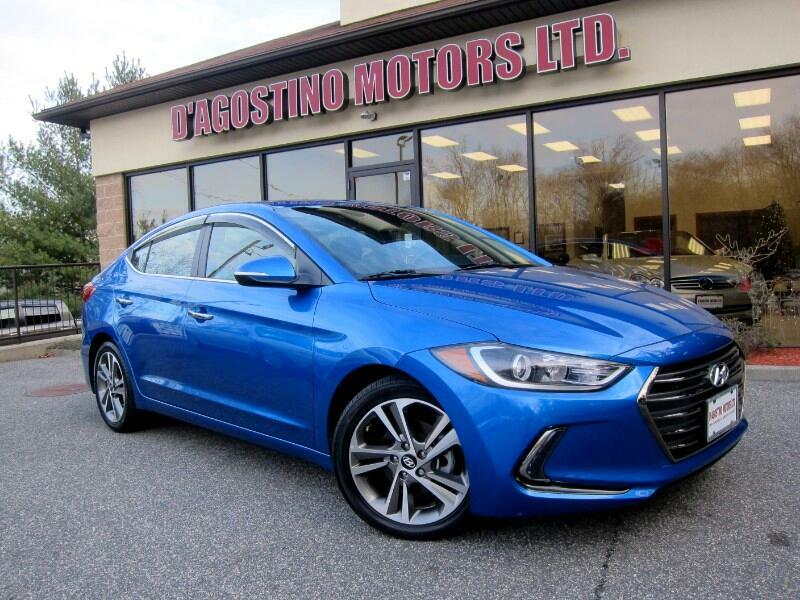 Used 2017 Hyundai Elantra Limited for Sale in Smithfield RI 02917 D'Agostino Motors Ltd.
NEW ARRIVAL !!! ONLY 14,000 MILES !!! 47 MONTH'S OR 45,000 MILES OF FACTORY BUMPER TO BUMPER WARRANTY !!! 107 MONTH'S OR 85,000 DRIVETRAIN WARRANTY !!! ONE OWNER !!! CLEAN CARFAX !!! This Elantra Limited is Super Sharp , Super Clean and has Great Technology. 8'' Touch Screen w/Infinity Audio System and Infotainment System , The Infotainment System that brings in Apple Carplay and Android Auto , Navigation , Back Up Camera , Bluetooth Phone Connectivity, Proximity Key , Push Button Start , Blind Spot Monitoring , Electronic Stability Control , Heated Leather Seats ,Multi Function Steering Wheel , Power Sunroof , 17'' Two Tone Alloy Wheels. Come Experience the D'Agostino Difference! We Go Through our Vehicles with a Fine Tooth Comb from All Mechanical Aspects to an Extensive Reconditioning and Detailing Process, Expect to View the Cleanest Vehicles in New England Guaranteed !! !